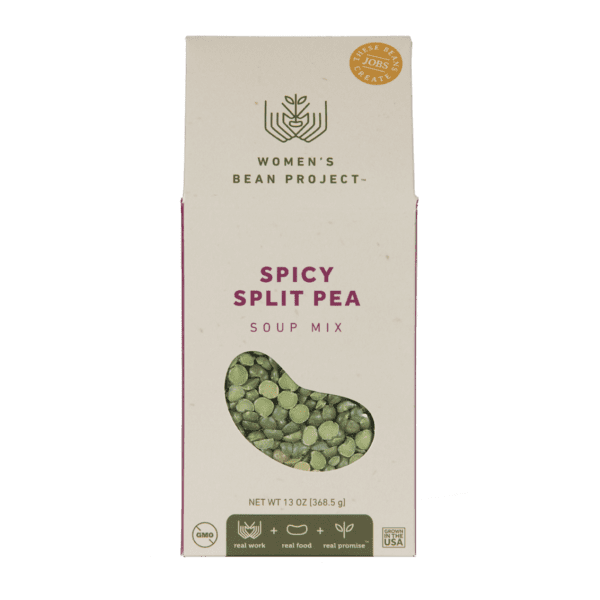 A unique blend of crushed red pepper, coriander, cinnamon, ginger spice and curry makes Women’s Bean Project’s Spicy Split Pea Soup Mix the most unique on the market. It is quick and easy to prepare, grown in the USA and Colorado Proud. 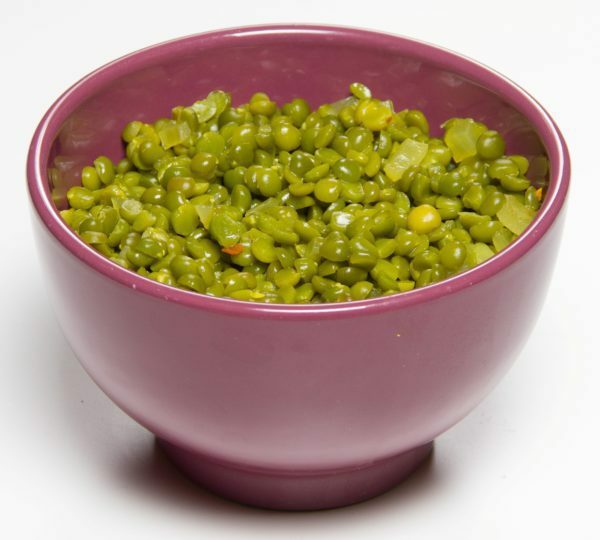 Split pea soup package includes green split peas and spice blend. I’ve loved this soup for years! We’re a family with professional chefs and I like to cook myself. I don’t think the spice blend could be improved. I fix mine with a bit of milk to make it a little creamy. It’s perfect to warm up a cold day. Knowing that one of the women who is benefiting from the Bean personally made the soup, warms my heart! Hi Julie! Thank you for all of your support over the years! We are so happy to hear you and your family have enjoyed our products for so long. That’s a great idea to add some milk, too! We hope you continue to enjoy our products and support our work. Thanks again! This soup is amazing. 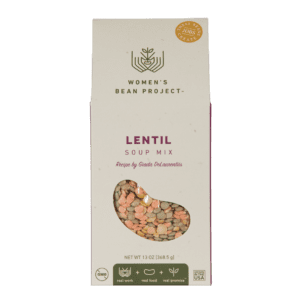 My wife, Christine said, “I don’t really like split pea soup, but I’m not sure why – this one is great!” I add like 1/8 cup of heavy cream to it – that’s what probably did it! Thanks Eric! Sounds like Christine is pretty happy with the outcome 🙂 We love that you also added the heavy cream to it to make it your own. Your support is much appreciated and we’re grateful for customers like you! Have a wonderful and safe Thanksgiving holiday. Sounds like the soup turned out delicious with the smoked sausage! That is something we haven’t yet tried, but will. Thanks for your support and feedback! I love pea soup. And this is one of the best. My mom and my wife make terrific pea soup but this is my favorite. I only added smoked sausage. Perfect! That’s great to hear Mary, glad you like the soup! You’re welcome. Isn’t the curry a great touch? Followed the recipe instrux and this split pea soup turned out awesome. Easy to make and yummy. I will be getting this again. Thank you for this excellent soup! So glad that you love the soup! And we’re excited for you to get your order as well! Not a person who likes split pea soup, but I make it for my husband. Bought one of the mixes and I have to say it is absolutely AMAZING. Can’t wait to get my order so I can make it. You’re welcome Erin! We’re so happy to hear you, and your boyfriend, loved it. 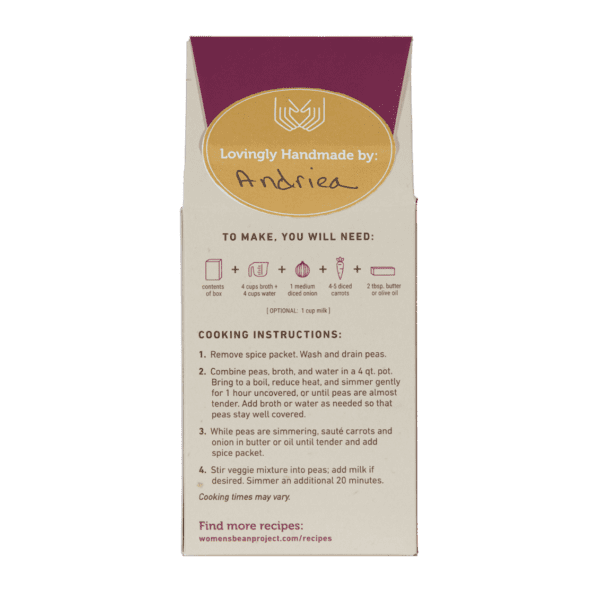 Our spice packets are a big part of the distinctive and full flavor of all our soups. Glad you’re back for more! Amazing spice mixture! Even my boyfriend – who typically doesn’t like vegetarian meals – really loved it. Now I’m back for more… thanks for the great meals!! YEAH! That is so awesome you are back for more Christine! Thank you so much for your continued support and purchases. 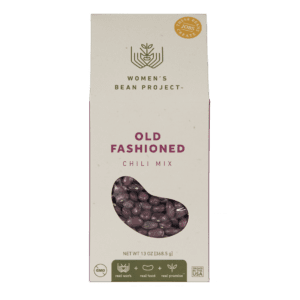 Your purchases help pay the women a steady paycheck while employed at Women’s Bean Project allowing them the opportunity to produce our delicious products for awesome customers like you! I am back to buy more! My family loved Giada’s and Toni’s soups as well but Sarah’s was the surprise favorite. That is so awesome Sarhan that your 9 year old loved our soup too! Thank you so much for sharing your feedback on our products as we couldn’t do it without amazing customers and supporters like you! We hope you enjoy the rest of our soups and treats! Yay for Sarah’s Spicy Split Pea Soup!! I made your amazing pea soup for my family last night. I have a very picky 9 year old who doesn’t like veggies, but LOVED this soup!! The carrots were amazing and the spice pack added the PERFECT flavors!! We are excited to try the rest of the soups that you offer, as well as the other goodies! Great food from an awesome group of women, what could be better then that!! Thank you so much for the feedback Sandra. We are so happy that you you like Sarah’s Spicy Split Pea soup! We appreciate your support of our program. Happy New Year! Oh, what a wonderful soup! My favorite is split pea. The right spices, too. Thanks so much for having your website to order in the future. All for such a wonderful cause. This world is blessed to have people to care about other people and help them thrive to live with a purpose. Will order soon. Thank to you! Thank you so much for the nice feedback on our soup. We appreciate your support. Every purchase provides hope for the women in our program. This is by far the best split soup I have ever had. I bought it yesterday, prepared and enjoyed it today and plan to go back tomorrow to purchase more. Thanks so much Tawny. The spice definitely adds that special flavor in our Sarah’s Spicy Split Pea Soup. Glad it turned out great. Next time, please take photos as you are cooking and share with us on Facebook! I love the spice combination in this soup – it was simple to make & is adaptable too (I added celery during the sautee) – turned out great! Thank you! Thanks so much Melinda for the awesome feedback! We are so glad you like the soup and appreciate your support of Women’s Bean Project! Next time, take some pictures and share with us on Facebook. Thanks for your support! Best Split Pea soup I have ever had! So much flavor and super easy to make! I have to eat two bowls every time I make it! Highly recommend from a wonderful organization!